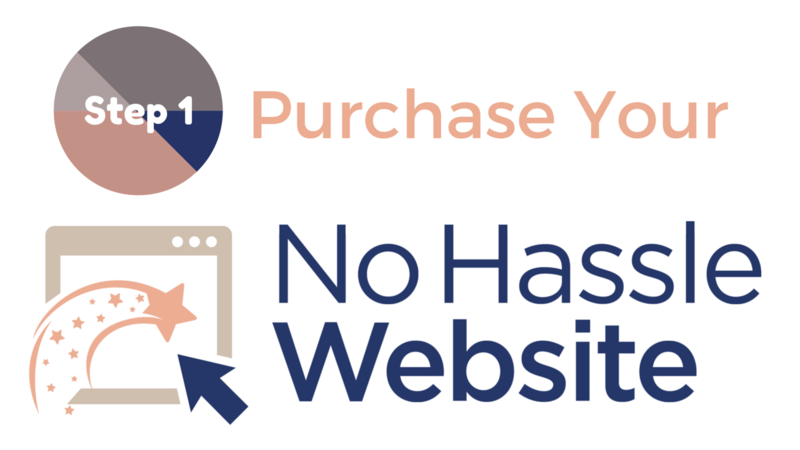 The first step is to purchase your No Hassle Website here. Shortly after placing your order, you will receive an email asking you to answer some questions about your preferences, domain and hosting (don’t worry if you don’t have a domain or hosting! We offer free hosting for 6 months if you need it, and most domains cost only around $12). Based on your answers and needs, we will explain exactly how to proceed to Step 2: If you already have a hosting service and domain, we will need you to give us access to your cpanel (hosting). If you would like us to host your website for free (for 6 months and only $9/month after that), you will just have to point your domain nameservers to our hosting (we will explain how to do it!). Within 24-48 from the time you give us access to your cpanel (hosting), or request to host your website for free (for 6 months) on our hosting service, we will install your No Hassle Website and provide you with your login credentials. The website we will install will look exactly like one of the Demo websites here (in Step 1 you will let us know which one you prefer!). Once installation is complete, you will be able to start setting up and customizing your website, and plugging in all your text and images (don’t stress! We provide detailed instructions on how to do EVERYTHING). Once your No Hassle Website is installed, you can start making it your own! Just follow our detailed & straightforward instructions on how to set up your website (=connect it to all your existing services/account like Facebook, your mail service, google analytics, and entering your business information etc.) and how to customize/update every page with your text and images etc. If you dedicate a few hours a day for a few days, you should have your entire website finished and ready to launch in as little as 2-3 days! If you have any quick questions while you are working on your website, we will gladly answer them and help! As a No Hassle Website customer, you also get FREE access to our closed Facebook Group where you will get answers to all your tech question and access to unique and exclusive new training regularly (on subject such as branding and marketing, Facebook Ads, how do webinars to grow your business etc.). We have yet to leave anyone hanging without helping them resolve their issues completely – so do not worry! You are not alone in this journey and we will make sure any challenge you may entoucnter it is resolved. Believe it or not… That’s it!